An in-Depth look with the Calibre de Cartier Chronograph. In 2010, Cartier introduced the Calibre de Cartier collection of watches housing their new in-house movement, the 1904 MC. This move was right in line with their strategy of strengthening their position as a manufacturer rather than just depending on quartz or modified ETA calibers for their timepieces. The Calibre de Cartier models feature round cases and partial Roman numerals on the dial. The watches include time and date functions. Three years later, in 2013, the House of Cartier extended the collection by adding the Calibre de Cartier Chronograph models—just like the model we see here. 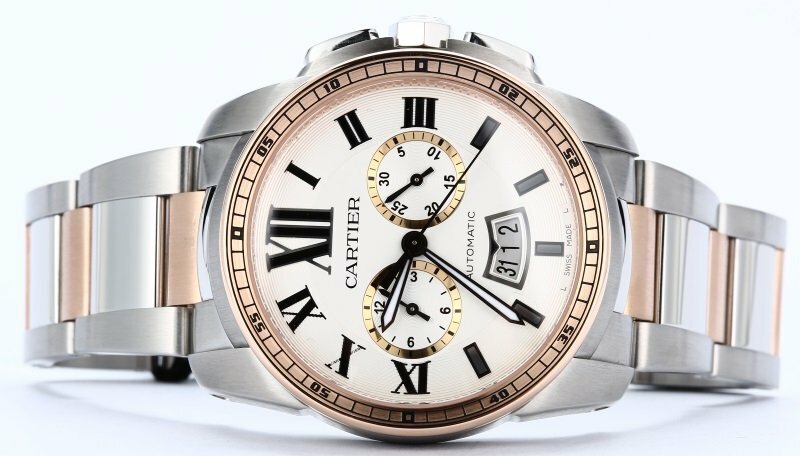 Calibre de Cartier Chronograph W7100042 is a two-tone version of the Cartier sports watch with a mix of stainless steel and 18k pink gold. The 42mm case is crafted in stainless steel and topped off with the pink gold bezel, while the predominate steel bracelet is accented with a smattering of pink gold links. The winding crown on the case is not only faceted but is also set with a blue stone—a hallmark of Cartier watches. Flanking the winding crown is the duo of pushers to control the chronograph function. The silvered opaline dial features a concentric pattern towards the outer rim, while the inner portion is smooth. Encircling the dial is an interesting mix of seven stamped Roman numerals along with five rectangular indexes. The steel sword-shaped hands are fashioned in black oxidized steel and are luminescent coated for legibility in the dark. Furthermore, the exterior rail track also has four lume plots. At the 6 o’clock position we see a calendar window with three digits—yeterday, today, and tomorrow. And finally, framing the center hands are the pair of registers also in pink gold. The Calibre de Cartier Chronograph is a perfect illustration of what Cartier does best—sporty and masculine, yet utterly elegant. 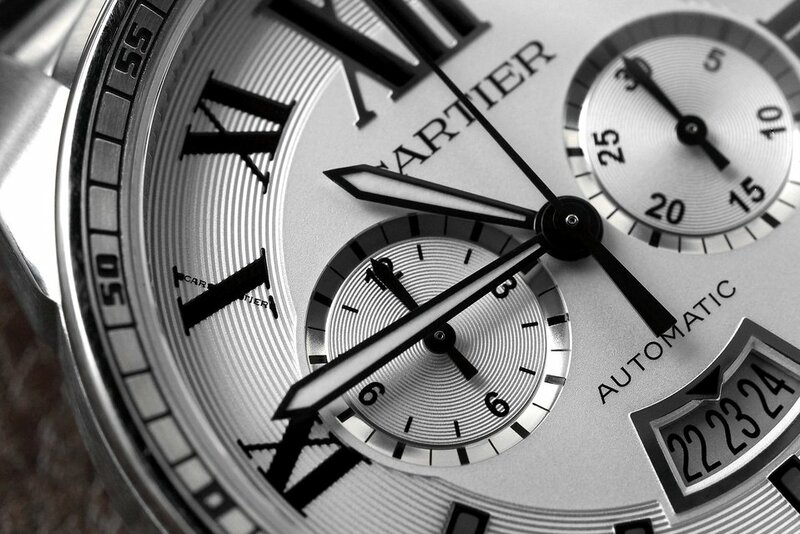 Aside from its attractiveness, the Calibre de Cartier Chronograph also boasts technical aptitude. Flipping the beautiful watch around, we can see the automatic winding caliber 1904-CH MC thanks to the sapphire caseback. 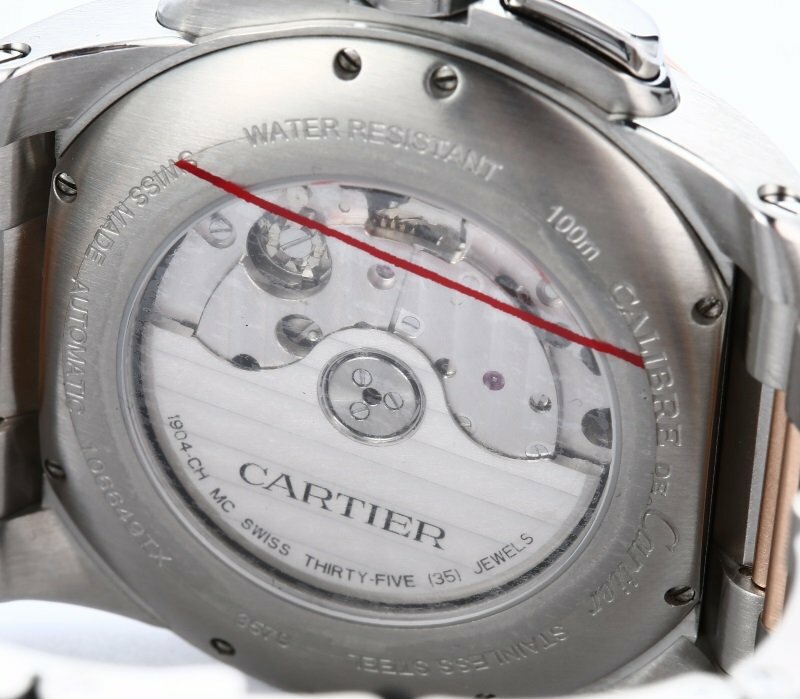 As previously mentioned, the Calibre de Cartier is equipped with Cartier movements built entirely in-house at the company’s facility in La Chaux-de-Fonds, Switzerland. This is certainly the right direction for Cartier. 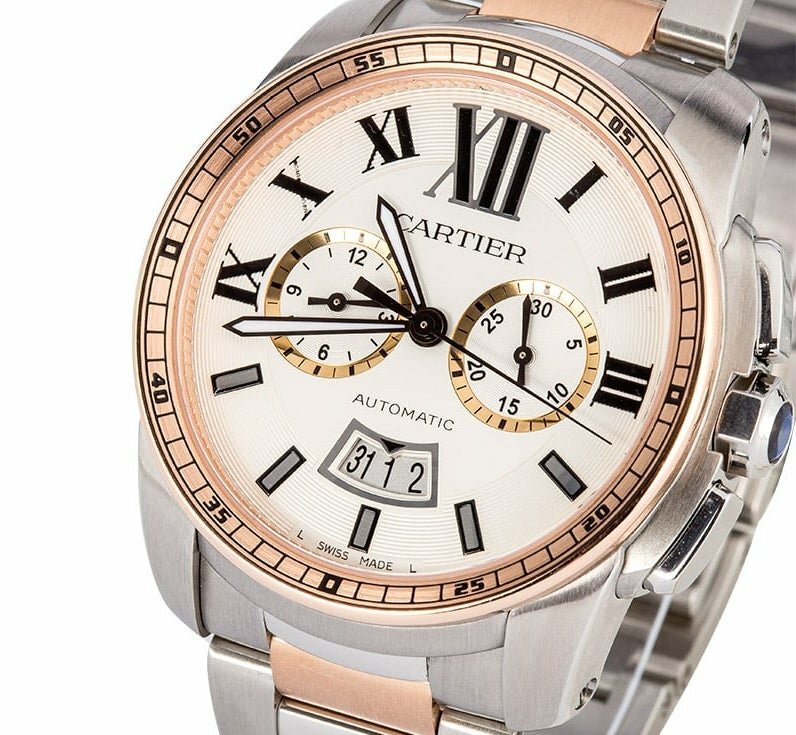 Specifically to challenge the naysayers who have criticized the company for not being a serious watchmaker (despite the fact that Cartier has always been one of the bestselling watch brands, ever). The column wheel of the 1904-CH MC ensures the precise and accurate coordination of the start/stop/restart function of the chronograph. Moreover, its vertical clutch eliminates the jittery motion of the hands that plagues chronographs with lateral clutches. Additionally, the vertical clutch saves energy when the chronograph is in use, thus aiding in the power reserve. The power reserve of the 1904-CH MC is 48 hours. Also, the automatic movement has a linear zero resetting hammer mechanism. This permits the seamless resetting of the chronograph, regardless of the force used to push the button. The master watchmakers at Cartier have ensured the highest degree of durability, accuracy, and reliability of the 1904-CH MC. A relative newcomer to Cartier and the world of horology, the Calibre de Cartier Chronograph is well on its way to becoming a signature model of the house. Pairing the unmistakable Cartier aesthetic with watchmaking savoir-faire is an enticing proposition indeed.